Spiral gift shop is one place where you can find a large variety of toys at reasonable price for the children of all age groups. 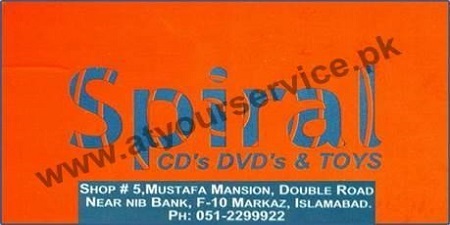 Spiral CDs DVDs & Toys is located in Mustafa Mansion, F10 Markaz, Islamabad. Spiral gift shop is one place where you can find a large variety of toys at reasonable price for the children of all age groups.